Virgin Galactic officials have said they hope to begin commercial flights aboard SpaceShipTwo out of New Mexico's Spaceport America by the end of 2014. The deal, which was announced Thursday (May 29), outlines how Virgin Galactic will work with the FAA's air traffic control center Albuquerque and the New Mexico Spaceport Authority to safely provide clear airspace for SpaceShipTwo space plane. The company's CEO George Whitesides said the new agreement brings Virgin Galactic "another step closer" to its goal of starting routine and affordable space launches from Spaceport America. 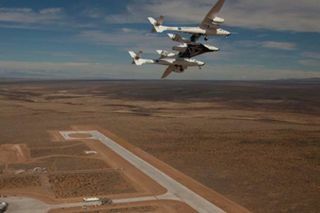 Virgin Galactic is considered the anchor tenant at Spaceport America and it began paying rent on a 20-year lease to conduct missions from the "Gateway to Space" building at the remote spaceport near Truth or Consequences, New Mexico, just west of the White Sands Missile Range. SpaceShipTwo, which can seat two pilots and six passengers, is designed to be carried by a mothership plane called WhiteKnightTwo. Once the linked vehicles reach an altitude of about 50,000 feet (15,000 meters), the spaceship will be released and its rocket engine will kick in, launching it into suborbital space. Virgin Galactic officials have said their passengers will get to climb out of their seats and experience weightlessness during the flight with a view of the curvature of Earth against the backdrop of black space. So far, several hundred people have purchased seats, which currently cost about $250,000, for Virgin Galactic's future commercial flights. Celebrity ticket-holders include Lady Gaga, Justin Beiber, Leonardo DiCaprio and Ashton Kutcher.